This quilt is my artistic depiction of the First Moon Walk – Apollo 11. The design of this piece was inspired by all the classic, iconic photos that were taken of that very first voyage to the moon. The center of the piece is grounded by the Lunar Module landing on the moon and the astronaut’s first step onto lunar soil. My love of satellite imagery inspired me to take this project to the final frontier: space. As a child, I remember watching on our black and white TV as man’s journey to the moon unfolded. It was a very exciting time in the history of mankind. The evolution of this project started by first putting together a concept drawing on paper with all the different subject matter which I wanted to interpret, and leading to the vision of what the first walk on the moon looked like. 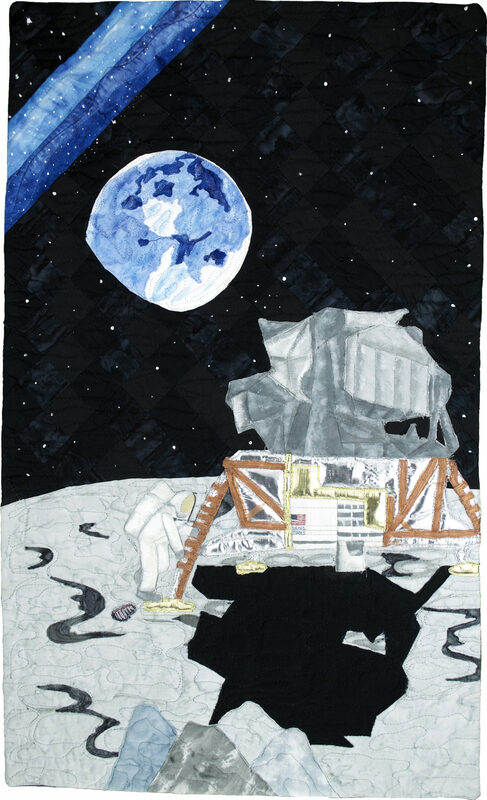 The main focus of this piece is the lunar module, commemorating Apollo 11 and the first walk on the moon. Neil Armstrong photographed Buzz Aldrin’s first footprint in the lunar soil. He wanted to study the nature of lunar dust with respects to weights and pressures on the surface of the moon which left a very compact shallow impression of Buzz’s boot. I wanted to illustrate the first footprint and how those clear impressions of the boots were characterized. The earth in the background demonstrates the spectacular view the first astronauts were lucky to experience. Thus my interpretation of such a spectacular event. Raw edge fusible applique, thread painting, acrylic painting and free motion quilting provided the details on this quilt. Batik and hand dye fabrics with Dream polyester batting. Thread painting with 35 & 50 wt. So Fine and Valdani threads. Setacolor and Lumiere acrylic paints.